THE 10,500km (6,500 mile) journey from Yiwu City in eastern China through Kazakhstan, Kyrghyzstan, Uzbekistan and Turkmenistan was sluggish. But when the first Chinese train pulled into Tehran station after a 14-day haul, Iranian officials hailed a great leap forward. “We’re becoming the global hub between east and west,” boasted one minister. By April, when the new trans-Kazakh railway opens fully, executives in Iran hope to have cut the journey time to China (see map) to just eight days—a month less than the sea route takes. Should Turkey get on board, the line might even challenge the Suez Canal as a primary Chinese and Iranian route to Europe. Iranian companies will no longer be limited to an 80m-strong local market, President Hassan Rohani’s advisers promise, but will be connected to the European Union’s 500m. Other rail links are coming down the line. Within six months Abbas Akhoundi, Iran’s British-trained transport minister, will open a track to Afghanistan’s mines, which will ship minerals to India via a revamped south-eastern port, Chabahar, bypassing Pakistan. Within two years Iran will have built a bridge over the Shatt-al-Arab river into Iraq and into the Fertile Crescent, he says. Fresh track will open the way through Azerbaijan to Russia and the Central Asian republics. “When we were inward we had poor cross-border links,” says Mr Akhoundi. “If we want to be outward-looking we need to improve them accordingly.” Iran also plans to more than double its internal 10,000km rail network over the next decade and replace rolling stock that trundles at 90kph with high-speed trains on electrified lines. 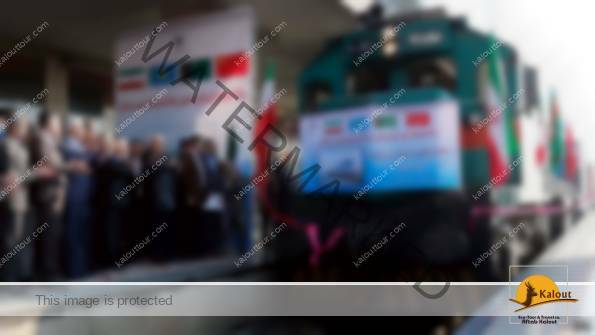 Once the upgrades are complete, the 420km journey to Isfahan will take 90 minutes and the 920km trip to Mashhad less than six hours. The hitch, of course, is finance. In Iran’s sixth five-year plan, now awaiting parliamentary approval, Mr Akhoundi wants to spend $28 billion on railways, $20 billion on roads, $50 billion on upgrading the country’s Shah-era air fleet and $7 billion on airports (including extending Tehran’s main airport, Imam Khomeini, so that the largest modern airliners can land there). Yet the low oil price means that his government can barely pay public-sector salaries, let alone pay for infrastructure. So it has been wooing foreign investors instead. They seem keen. To finance the Mashhad line, China has reportedly offered a $2 billion loan, apparently underwritten by Iranian oil proceeds it had frozen during the time of sanctions. South Korea is exploring a similar deal. And while Italians recently waited in the wings, French rail executives, model trains in hand, paced the corridors of a Paris hotel waiting to greet Mr Rohani on the first trip by an Iranian president to Europe for 17 years. But with most foreign banks fearful of American fines, raising credit remains difficult. A “silk rail” between east and west will also require better relations with neighbours who fear Iran’s post-sanctions rebound. “The nuclear deal has proved a double-edged sword,” moans a member of Iran’s Chamber of Commerce. “While relations have improved with the West, they have deteriorated closer to home.” Russia suspects that Iran will come to challenge its dominance of regional markets. And the United Arab Emirates, which backs Saudi Arabia in the region’s sectarian power struggle, fears that Iran, with its many tourist attractions, might challenge its position as a regional transport hub. Much will depend on Mr Rohani’s diplomatic skills. Turkey’s prime minister, Ahmet Davutoglu, visited Tehran on March 4th with six ministers and discussed a high-speed rail link that might bridge Lake Van and triple bilateral trade, despite arguments over Syria. But should tensions persist, Iran is also exploring the seas. In February an Iranian cargo of petrochemicals arrived in Antwerp, the first Iranian ship to offload in Europe for six years. IRISL, the national shipping line, has plans to ship to the Far East, Oman and eventually the Americas; it hopes to enlarge its 160-strong fleet by floating some of its stock by the end of this year. Iran Air might go the same way after two years of restructuring, says the transport minister. Get ready for Iran’s reconnection with the world.